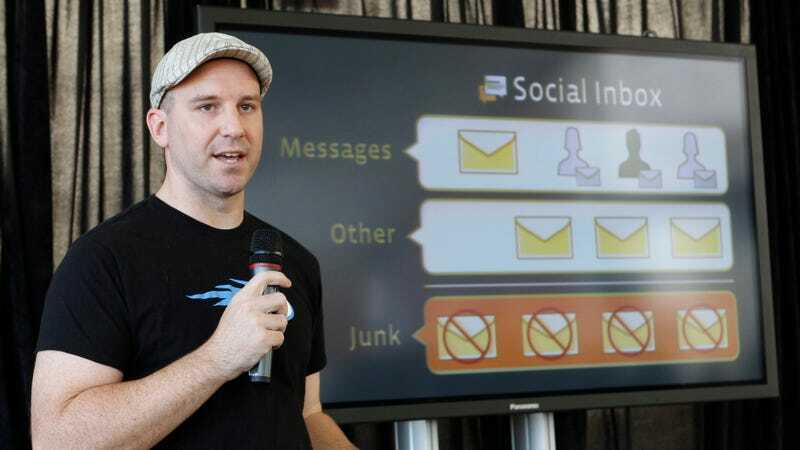 Facebook engineer Andrew Bosworth talks about the new Facebook messaging service at an announcement in San Francisco, Monday, Nov. 15, 2010. In 2016, a top Facebook executive wrote in an internal company memo that said Facebook may be used to coordinate terrorist attacks and that it might cause deaths from bullying, but that those effects were justified in the name of corporate growth. After BuzzFeed published the memo on Thursday, the executive, Andrew “Boz” Bosworth, VP of consumer hardware, claimed that he didn’t agree with his own statements, even as he wrote them. “The purpose of this post, like many others I have written internally, was to bring to the surface issues I felt deserved more discussion with the broader company,” he said. Over the past two weeks, those practices have caused an uproar internationally over the compromise of data belonging to at least 50 million users at the hands of Cambridge Analytica, a political consultancy that worked for the Trump campaign and simultaneously aided one “Leave” campaign during the UK’s 2016 EU referendum. The presence of Mark Zuckerberg, Facebook’s co-founder and CEO, has been requested by Congress and by the British parliament, though Zuckerberg reportedly declined the latter’s invitation. Per BuzzFeed, Bosworth’s memo, titled “The Ugly,” was posted internally at the company one day after 28-year-old Antonio Perkins captured his own murder on Facebook Live.